The study, "Food Inequality, Injustice, and Rights," looks at international food trade and whether it enhances or erodes equitable access to food across the planet. The researchers analyzed annual United Nations data on international food trade from 1986 to 2010 in nearly 180 countries, and focused on 266 commodities such as rice, wheat, maize, and soybeans as well as animal products. "This study shows that trade plays a very important role in distributing food more equitably across the planet, from countries with high production like the United States and Brazil to nations with more limited agricultural resources like Japan and Middle Eastern countries," says Kyle Davis, a postdoctoral fellow with the Data Science Institute and co-author on the paper. Reported by ministries within each country, the United Nations data provide information on the exporting country, the importing country, and the amount of each commodity flowing between them. By combining all of these linkages, the researchers were able to develop a network of international food trade for each commodity and each year. 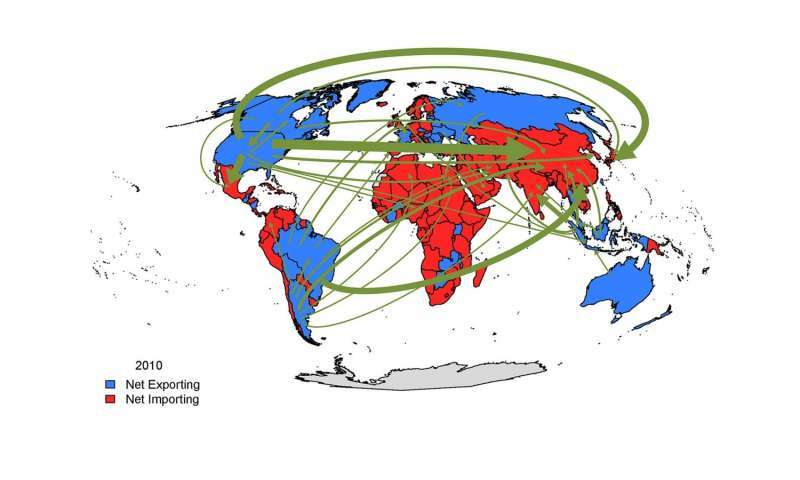 And by assessing how these networks redistribute food across the planet—and comparing this with a hypothetical world in which no trade occurred—Davis and his collaborators were able to examine whether rights to adequate food were closer to being met under globalization through food trade. In a key finding, the authors maintain that international food trade makes for a more equitable distribution of food to the world, ensuring that places with large populations or with limited agricultural resources such as arable land and water can obtain the food they need. "While we've shown that, in most cases, enough food supply reaches countries because of international trade," says Davis, "we still hope to better understand how that food gets spread among a nation's population and how we can ensure that lower-income communities can obtain nutritious food as readily as wealthier people." In addition to Davis, the team who worked on the paper include lead author Paolo D'Odorico at the University of California, Berkeley; Joel Carr at the University of Virginia; Jampel Dell'Angelo at Vrije Universiteit Amsterdam; and David A. Seekell at Umeå University, Sweden. "Being a postdoctoral fellow at the Data Science Institute has given me the time, resources, and intellectual freedom I need to research and publish in a field—sustainable food systems—about which I am deeply passionate," says Davis. "It is my hope that all of this work can contribute to improving the physical and economic access to food for the world's vulnerable populations while preserving our planet." If you have 6 kids you will run out of food, yes? Regions that cannot grow their own food are overpopulated. Invoking religion to take other peoples' food is immoral. Support your population or don't have kids.